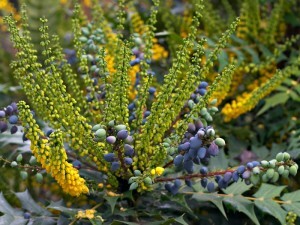 Welcome to Mahonia.co.uk, the internet biggest Mahonia site offering FREE information on this magestic plant! There are around 70 species of Mahonia which are originaly from Central America, Northen America, Asia and Himalaya but are now found all over the world and are particular popular in the Uk. Mahonia are typiacly grown for there attractive dark green foliage which are made up of long leaves consististing of around 5-20 leaflets depending in the age of the growth. They are a evergreen shrub and from around late autumn through to winter they then produce long stalked bright yellow flowers which shoot out from the ends of leaves, on smaller plants in pots they tend to shoot from the centre of the plant, after flowering purple fruit are produced. There are a few common varieties of mahonia which are particular popular which include Mahonia ‘Japonica’ which reaches around 7ft (83″) tall by around 9ft (108″) and Mahonia x ‘Media Charity’ which again grows to around 9ft (108″). Another variety is Mahonia Aquifolium which is one of the smaller varieties and only reaches around 3ft (36″) but is ones of the hardest of the Mahonia family. Varietiey: There are many variety available including, ‘Media Charity’, ‘Japonica’ and Aquuifoloium. How easy to grow: Mahonia are easy to grow without much trouble. 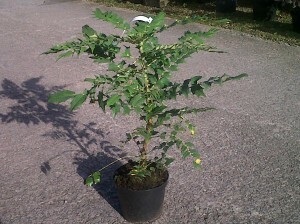 Site: Mahonia’s grow well in full sun, semi-shade and will also grow in shade. Soil: Mahonia will grow in most soils without any trouble including clay, sandy, dry, moist. Height: Depending on variety, some grow to 9ft (108″) and smaller dwarf varieties grow to only 3ft (36″). 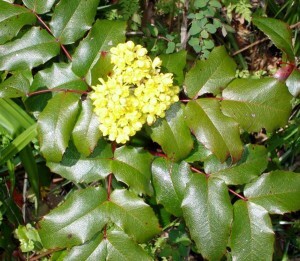 Flowering: Mahonia flower from November – March. Fruit: Mahonia produce a black fruit after flowering and some are used for making wine. Mahonia’s can be planted in the back of boarders and require quite abit of space if you plant one of the larger varieites such as ‘Media Charity’. By planting perennial plants in front of your Mahonia bush when the perennials die back to the ground in Winter your Mahonia will just be starting to flower and you will be able to enjoy the yellow winter flowers produced. Larger varieties are also ideal for using as screening and also act as a intruder deterrent because of there very spikey nature and thick habbit. 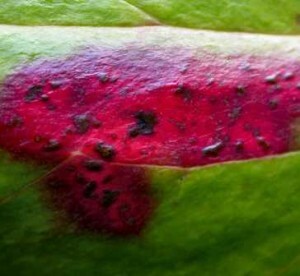 Mahonia are generaly pest free so aphids are not a problem but they can suffer from Rust and Powdery Mildew. Mahonia’s effected by rust will have black spots on there leaves with yellow around the edges, it is simular to rust commonly found on garden roses and can be treated which a garden fungicide. Powdery Mildew is also easy to spot as the leaves start to get covered with a white powdery substance, this is also treatable by using a garden fungicide. 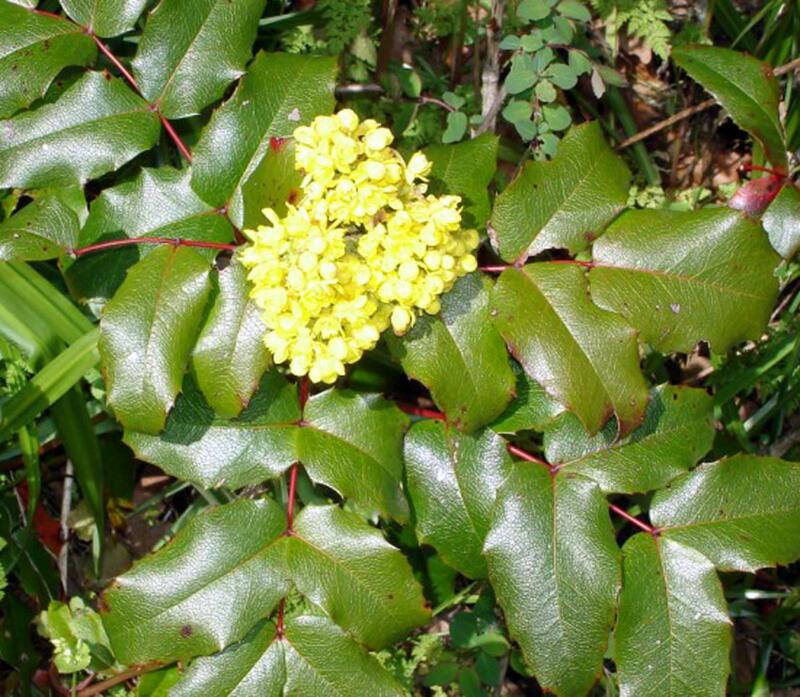 Mahonia are best left unpruned if possible but there are instances when you may want to prune a Mahonia shrub. All pruning is best done in late summer, you can prune out any damaged or diseased branches but as disease is not really a issue with Mahonis this is proberly not needed. If you have an established Mahonia that seems bare at the bottom and has long bare branches reaching out then they can be pruned to encourage new growth. First you can prune out some of the branches totaly to let more light into the centre of the plant, this will encourage new growth in Spring. Long branches that are bare untill the wnd of the branches can be pruned so that the branch is only around 1ft (12″) long, this will encourage new leaf growth in these branches. Finaly pruning can be done to keep the shrubs shape well rounded by trimming leaves off to form the desired shape. Like mentioned above Mahonia are best left unpruned but giving them a little pruning or even a hard pruning will not do them any harm. Planting a Mahonia – Before planting soak the roots in a bucket of water for around 20 minutes, never plant the roots dry. When planting the Mahonia you can add a small about of Bone Meal or Fish Bloog and Bone. This will encourage new root growth when the Mahonia is planted and will give it a good start. Mahonia are fully hardy and when left to go it alone are very unforgiving and will do fine but they will benifit from a little care to help them over the winter specialy if they have had a hard pruining. You can mulch around the base of the Mahonia plant with with a thick layer of organic matter or compost or other mulch material, this will act as a protective layer and help stop the frost getting to the roots.